Today, Gracia asked me for this recipe. So here it is Gracia. This recipe is easy, simple and it taste great too. 1. Cream butter with both sugars. Beat egg with vanila and add to butter mixture. Mix well. 2. Sift flour, cornflour, bicardonate of soda and salt together. Add to creamed mixture, mixing to a soft dough. Stir in nuts and chocoloate chips. 3. Shape dough into a ball, pinch off pieces and roll into balls, flouring your palms occasionally if necessary. Place on oiled baking trays leaving room for spreading, and flatten lightly with a fork. Bake at 180ºC (350ºF) for 20-25* minutes. Carefully remove to wire rack to cool. Note *: I have changed the timing to be longer so that you can get a more crispy texture to the cookies. A very big Thank You to u :) for taking the afford to put up the receipe for me. Will try it out tontie,if I can get all ingredients. I am very sure my dd will be very happy if I can make it right as she have been buying the cookies from her school tuckshop, which cost 2pcs for 10cent. will take a pix to show. Yes, pls show pix so that we can drool over it. Heehee. Opsss.. so sorry, don't know how the post doesn't show my name. Qs : 1)is bicarbonate of soda same as BAKING SODA? 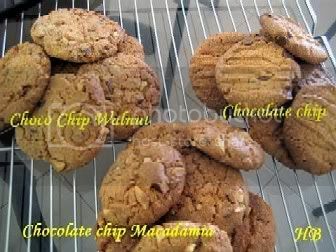 2) in yr pixes, there are three diff type of cookies, does it mean u div the mixture into three and mix in diff nuts. Gracia, bicarbonate of soda is the same as baking soda. I double or triple my recipe. Divide out the dough and mix with different types of nuts. Is this 60gm of brown sugar or 60ml? very pai sai for being so blur. Gracia, I changed it to 60 gm liao. LeeLee, the cookies look so delicious. How I wish my hand can go thru the PC and grab one piece! at last..... I baked it last nite. I do not have a digi weighing machine, mine is the needle type. 1)how come my dough is very, very sticky and it is not possible for me to shape dough into a ball and pinch off pieces and roll into balls? 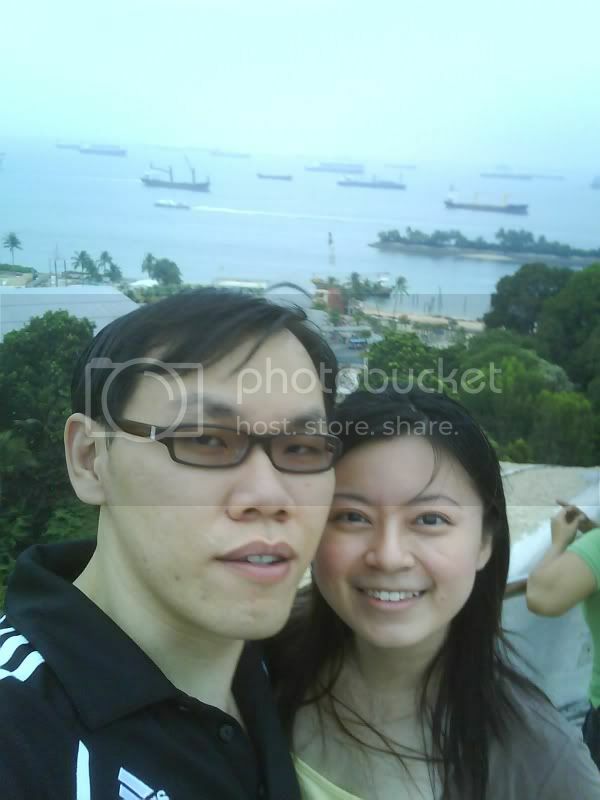 4) how can I upload the pixes into yr blog? Gracia, I think it is good to invest in a digi scale. I can't live without one now. Haha. Your oven temp may be the cause for your uneven colour of the cookies. Remember to flour your hands when shapping the cookies. If you like, you can use a fork and spoon to drop the cookies on the baking sheet. Dont make the cookies too thick as the centre will not be cooked and it will be chewy. Hi leelee, can i change the chocolate chip to Dark choc chip? Hi Siti, sure, you can add in whatever chocolate chips you fancy, eg. white chocolate chips, etc. Hmmm... This recipe is the BEST! I love it and it's my favourite Chocolate Chip Cookies! Thanks Leelee. Gracia, I normally line my baking sheets with non-stick baking paper. I tried baking the chocolate chip cookies. As what Gracia mentioned earlier, the dough was very sticky and unable to shape into a dough even I flour my hands. In the end, I use a spoon to drop onto the baking tray. When I put into the oven to bake, it spread out and it became very flat. It became chocolate chip biscuit and not cookies. I was unable to get the thickness of the cookies as shown in your picture. However, the taste is very good. My family love the biscuit. Should I add more flour to shape the dough and how to prevent the cookies turning into flat biscuits? Please advise. Many thanks. If the dough is too sticky, just spoon or scoop using a ice cream scoop to drop the dough onto the baking tray. Accordingly to one of my blogpal Zu, if you don't want the dough to be flatten during baking, do not overbeat the butter. Zu also advised that you use a good quality butter. I think Zu substituted some of the butter for shortening in order not to get a flat cookie. But you can try not overcreaming your butter first. If still doesn't work, then try substituting a little of the butter for shortening to try again. HTH. This recipe is really great! Will definitely make more of it!! By the way, I half the portion with peanut butter chips instead of chocolate chips, and its work out really fine for me! Cheers to you! wht type of cookie is this? Chewy or crunchy? can we omit the cornflour? How can we tell whether the butter been over beaten?? can give advice? i never succeed in baking good cookies..dunno y...so been trying to find out y now.. hope to receive your reply soon!.. Hi Sylvia, the corn makes the cookies crunchy and light. Omitting it may not give you a very crunchy cookie. Hi Dls, the butter should just be fluffy and creamy. Not flat and runny. Do you need to roast the nuts a bit before using them?If you do must it be cooled first b4 using? Can I change the choco chips to Cornflakes instead ? Hi Anonymous, yes, roast it at 180C for abt 10 mins before using them. Mrs Kuo, yes can change using cornflakes. It will give a nice crunch to your cookies. i've been coming here everytime i go online since my mum introduced this site to me. I'm wondering if you know how to make or get icing cookies. You know those hard ones, are they frosted or something? I think I am really improving on my bakery skills after trying out some recipes at your blog. Thanks alot! I baked these cookies a few days ago and it turned out really well. Even though the cookies were a little flat. I will try not to overbeat the butter on the next attempt. may I know what is gm means in your recipe. Sorry, silly question, totally new in bakery. Hi Anonymous, I have amended the recipe to indicate the measurements as 'g' = grams. Actually if you don't want to have flat cookies, you will need to add in more nuts into the batter so that when the cookies are baking, it will not spread so much. For me, when I bake them with just chocolate chips it spreads and flatten out too. But I like it like that as I will tend to bake it a little longer to get a crispy texture. this recipe is fabulous. tried baking cookies for the 1st time and it turned out pretty good. i omitted the nuts and added 60g choc chips instead. cookies was slighly flat but it dint really matter to me. baking for 15 mins wasn't enough to give that total cripsy texture for me. it turned out to be like 80% crispy in texture and the rest 20% chewy. in fact i liked chewy cookies better. im thinking of adding cocoa powder the next time to make it double choc cookies. how much cocoa powder do i have to add? Thanks for the recipe. Your blog really moivate me in baking. I just try the recipe over the weekend. Its taste great. But the most outer layer of the cookie is always more burnt, I try lower down the temp and baking time to 15 mins for the second round, but some of them still have this problem. One more thing, my mum say is not "Xiang"(Fragnant enough), she say maybe due to the butter. May I ask is the brand of the butter plays a part in the taste?the last time i bake pineapple tarts,she say the same thing. By the way, I use very normal butter - those $2 ones from Phoon Huat. Which brand of butter do you usually use ? do you mind if i post the recipe on my blog? the cookies are absolutely mouth watering. Can i use baking powder in place of baking soda as i don't have the latter? WHat would be effect if i do the substitution? Can I use all white sugar? If yes, may i know how much should i be using and what would be the effect on the texture of the cookies? Many thanks! Hi Baking Librarian, go ahead and post as long as you give due credit. Hi LPY, you can replace with baking powder. Should not be much difference. You can use all white sugar but unless you have a sweet tooth, you may want to reduce the white sugar to around 100g or 110g. All white sugar will make the cookies more crispy but using some brown sugar makes the cookies more fragrant. how many cookies can this recipe make? Thank You! Another GREAT recipe of yours. I almost finished all the chocolate chip cookies that I baked 2 hours ago, my family and I LOVE it. Delicious & crunchy! Honestly better than FA. I will definitely bake it again and again. I'm a newbie in baking. I've always wanted to make my own choc chip cookies. But i vaguely remember there's a method called "rub in type" to make choc chip cookies. My home econs class (eerr > 15 yrs ago?) taught that. Can you teach me how to modify your method for rub in type pls? wish to ask. if i was to used fine sugar instead of caster sugar. should i reduce the sugar amt? and by how much? Ling, you still use the same amount if you use fine sugar. wish to ask how many cookies can you make???? Hi Mar, hard to tell you exactly how many as it all depends on how big you make them. But if it is medium size, you can definitely get more than 20 pcs. thnks for the reply. i will be using the cookie scope, think can get abt more than 20pcs ba... btw how long can this cookies keep in a air tight container? i would like to ask u if u have any idea why the cookies that i bake is not hard or crispy.instead it is very chewy. I love your blog and I follow you steps to do the Chocolate Chip cookies with almond. The cookies turn out great but I am not sure myself if it is should be like that or not. It didn't turn out like Famous Amos but more like Subway Chocolate Chip cookies. Mind to have a look ? I don't know how to leave a picture here but I do have it on my Facebook. You are most welcome. Happy that your family enjoys your baking.